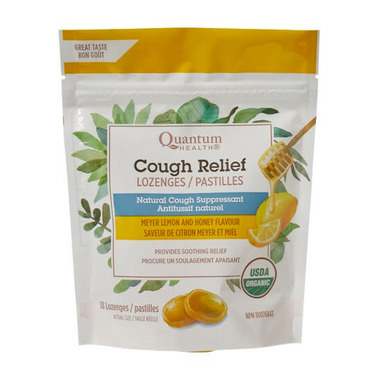 Our organic Cough Relief lozenges are made of the highest quality ingredients, including menthol, slippery elm, honey, Meyer Lemon and other natural flavors. They provide soothing relief for when a cough or sore throat is getting you down. or as directed by a doctor. Medicinal Ingredients: Menthol 5.97mg, Organic Slippery Elm Bark Powder 10mg. Non-medicinal Ingredients: Organic Brown Rice Syrup, Organic Sugarcane Juice, Organic Honey, Natural Lemon Flavour, Organic Turmeric.